Q: I desperately need some advice! My ex-husband has recently been murdered by his live-in girlfriend. He and I stayed in touch and were friends, even though I remarried. He told me about a year ago that I was still his 401(k) beneficiary. My ex's family are very wealthy, and they hate my guts. They have taken total control of his estate. I believe that given the opportunity, my ex mother-in-law would contest anything coming to me. She even told lies about me at the funeral when I was just a few feet away. What do I need to do now? Should I wait to see if the company holding the 401(k) retirement account finds me? I now have a different last name and address, but my Social Security number matches my newly married name and new address. A: Wow. This sounds like a combination of classic soap opera and modern reality show! Let's start by eliminating everything that's highly dramatic, but legally irrelevant. Your former in-laws' great wealth and intense dislike of you, your former mother-in-law's probable desire to rob you of an inheritance, the fact that your former father-in-law works for the same company as your ex, your recent unemployment and need for the money -- none of this has any bearing on your legal situation. There would be nothing inappropriate or unseemly about your calling or writing to your ex-husband's employer and asking if you are the designated beneficiary on his 401(k) account. But it isn't necessary. Based on what you say, all you need to do is sit tight. If you're still listed as your ex-husband's designated 401(k) beneficiary, your Social Security number is all the plan administrator will need to find you. 1. Your ex-husband didn't remarry. If he had remarried, his new wife would be legally entitled to be his 401(k) beneficiary. What happens when a 401(k) plan participant remarries, but his beneficiary designation form still lists his ex-wife? "Then the beneficiary designation form is canceled, and the participant's account is paid to his current wife," says Robyn Credico, an employee benefits expert at Towers Watson in New York City. But if your ex was unmarried and you're still listed as his beneficiary, you are entitled to the account. This would be true even if his death had been accidental and had left his live-in girlfriend emotionally and financially devastated. 2. A 401(k) plan designation is not subject to legal challenge by the decedent's parents. From what you say, it sounds as if your ex had no will. When you die without a will, the state's intestacy law dictates who gets your estate -- and in many states, when you die unmarried and childless, the law says your estate goes to your parents. But the intestacy law applies only to assets that would have passed through your will if you'd had one. It doesn't apply to assets that pass 'by operation of law' -- i.e., assets that have designated beneficiaries or are jointly owned with right of survivorship. In other words, even if your former in-laws have inherited their son's estate and all his personal belongings, they can't contest his disposition of his 401(k) account, his life insurance policy, his 'in-trust-for' bank account, or anything that he owned jointly with right of survivorship with another person who survives him. 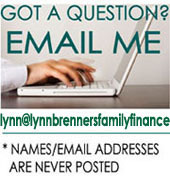 Please send your questions to Lynn@LynnBrennersFamilyFinance.com. I'm sorry I can't respond personally to every email. Questions are addressed only online. (c) Lynn Brenner, All Rights Reserved. DAD'S WILL IS MISSING: did his wife destroy it? Q: My father knew he was terminally ill, and went to an attorney to have a will made. My brother and sister were at his house when he returned, and he told them, "Just got back from the attorney, my will is all drawn up, everything is taken care of." He passed away several months later. A: This sounds like a promising plot for a 'Law and Order' episode. But don't leap to conclusions yet. Your stepmother may be innocent of any crime. Destroying someone else's will with intent to defraud is a Class E felony, says Gregg M. Weiss, an estate lawyer at Gardner & Weiss in New York City. But what your father said to your siblings doesn't prove the existence of a later will. A person who is old and sick and feels pressured to write a will sometimes tell his relatives he has done so even when he hasn't, just to reassure them. And even if your father did have a new will drawn up shortly before he died, your stepmother may not have known about it. As for the will she presented to the court, the fact that it isn't notarized doesn't cast doubt on its validity. A will must be signed and witnessed by two people to be accepted by a New York court, but there's no requirement it be notarized, says Weiss. "What you often see attached to a will is an attesting witness affidavit, and that affidavit is notarized," he says. "That's good legal practice, but it's not a requirement." It's not a foregone conclusion that the court will accept the will your stepmother has presented. The probate process will give you and your siblings plenty of opportunity to voice your concerns, says Weiss. He suggests you search through your father's checkbooks for a payment to a lawyer. "The checks he wrote are a road map to his life -- and you're talking about a relatively narrow period of time between his statement about visiting a lawyer and his death," he says. And what if the court accepts the will your stepmother presented, and you subsequently find a later one? There is no statute of limitations for the court to accept a later will, says Eric Kramer, an estate lawyer at Farrell Fritz in Uniondale New York. But of course, the sooner it's found, the better. The more time has elapsed, the less likely it is that a court will agree to hear about it. This is a cautionary tale. Weiss and Kramer both advise readers to leave the original copy of their will with their lawyer, and make sure that family members know that lawyer's name and telephone number. "Your situation could have been avoided if your father had told your siblings his lawyer's name," says Kramer. POLICE INVESTIGATE MOM'S DEATH: How soon will I get inheritance? A: Not to minimize your tax concerns, but the real attention-grabber here is that open police inquiry. It raises the intriguing question of how suspected foul play may affect the distribution of an inheritance. But let’s start by answering the question you asked. The 401(k) plan administrator may not be familiar with the new law, called the Pension Protection Act of 2006. That law is unambiguous: After Dec. 31, 2006, a non-spouse beneficiary can roll the distribution of an inherited 401(k) account into an IRA, regardless of when the original account owner died. If your late mother's 401(k) isn't distributed until 2007, you can roll the lump sum into an IRA, says Bob Walter, a principal and benefits consultant at Buck Consultants in Secaucus, N.J. You can then take taxable annual IRA distributions based on your own life expectancy. That would save you a lot of money. But you can't compel the plan to delay the distribution just because the law will change, he adds. A 401(k) plan is obligated to follow its own rules. And most plans require the payment of lump-sum distributions to non-spousal beneficiaries "as soon as practicable after death." In this case, there has been a delay – and your letter implies that's because of the police investigation. It's possible that investigation has delayed the issuance of a death certificate, says Walter -- and no 401(k) plan administrator would make a beneficiary distribution without seeing a death certificate. But if the death certificate has been issued, he adds, the fact that there's an investigation wouldn't hold up the 402(k) distribution. Insurance companies, which are state-regulated, automatically delay distribution of assets when a death is being investigated by the police, because state law doesn't allow anyone to benefit from a crime, says William Cornachio, a partner at Rivkin Radler, a Uniondale law firm. But a 401(k) plan wouldn't normally delay a distribution to comply with state law, says Walter, because 401(k) plans are federally regulated. But a civil verdict of wrongful death might not prevent a beneficiary from inheriting from the person whose death he caused, adds Cornachio. The reason: a wrongful death may be the result of pure negligence rather than an intentional act. "Causing Dad's death because you backed the car out of the garage and didn't see him in his wheelchair in the driveway might not bar you from inheriting," he says. "Driving head-on and hitting Dad in his wheelchair at 30 miles an hour – yes, that probably would bar you from inheriting." Q: Two years ago my son moved to Florida, where he fell in love with a girl who had baggage. Shortly after they met she informed him that she was wanted by the FBI for bank and credit card fraud. Although she claimed to be innocent, she was tried, found guilty, sentenced to three years and required to pay back $250,000 in restitution. A: The young woman's past won't affect your son's credit rating if he marries her. But it's going to make their financial life very difficult. Your prospective daughter-in-law's criminal conviction can't taint your son's credit rating. Each spouse's credit rating is based on his or her individual record. Nor will her $250,000 liability become a joint liability if she marries him: No one can garnishee your son's salary to repay debts she incurred before they married. This young woman will never get credit again. They'll never clear her debt, because this type of liability can't be discharged in a bankruptcy. So their ability to borrow - to get a mortgage and a car loan, and to make credit card purchases - will depend solely on your son's credit. And it's extremely unlikely that anyone will ever hire her. So your son will be the sole breadwinner. "If he applies for a loan to buy something in his name alone, the issue of her credit rating probably won't come up," says Matthew G. Roseman, a Garden City bankruptcy attorney. "But her name could never appear in title to anything they owned." Although his wife's criminal track record won't taint his credit record, in the real world it may still hurt his ability to borrow, says Anthony Sabino, a Mineola bankruptcy attorney who is also an associate professor of law at Tobin College of Business at St John's University. Any lender who runs a credit check on his wife may decide to charge your son a higher rate, or even refuse to lend to him, explains Sabino. Banks can't discriminate on the grounds of race, gender or religion - but there's no law against refusing to lend money for business reasons. A prudent lender could conclude that your son's ability to repay loans is impaired by a wife with a criminal record and $250,000 of outstanding debt. As a potential lender to this couple, you, too, should bear this in mind. Finally, her criminal record could hurt his employment prospects. "In the Internet age, information is readily available -- and job background checks sometimes include spouses," Sabino points out. Needless to say, none of this augurs well for their future happiness. But you'd be wise let your son reach that conclusion himself, hopefully sooner rather than later. The more spirited your opposition to the marriage, the less effective it's likely to be.